EDITORS NOTE: See the Pedro Garcia letter at the bottom of this story. For a guy who doesn’t seem to exist, Pedro Garcia is the talk of the town in Cambria. 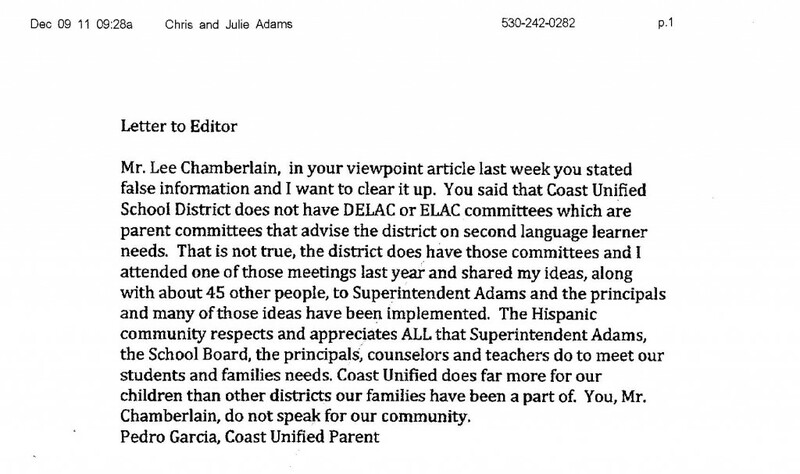 That’s the name printed at the bottom of a Dec. 15 letter faxed to the editor of the local newspaper, The Cambrian, a letter which simultaneously praises Chris Adams, superintendent of Coast Unified School District, and excoriates a parent and student. But despite the best efforts of many in the small oceanside community of 6,000 — including those of a private investigator, and a parallel probe by CalCoastNews — “Pedro Garcia” is nowhere to be found. A clue to his identity, however, might be found in the printed heading on a fax copy of the letter provided by the newspaper, which reads: “Chris and Julie Adams” and “530-242-0282.” That telephone number was issued to the Adams while they lived on Chancellor Road in Redding three years ago, is still listed with the Adams, and is currently operative. Dialed numerous times by CalCoastNews, the number simply rang. Longtime Cambria resident Monica Soto Raethke said she was baffled when she read the letter in The Cambrian. Soto secured a copy of the letter from acting editor Bill Morem at The Cambrian, and conducted a database search using the faxed letter’s imprinted telephone number. She said she was “puzzled and shocked” to discover who appeared to be responsible for the fax. Then, she went to The Cambrian office to verify the fax’s source information. Extensive searches by CalCoastNews of several databases turned up only one reference to “Pedro Garcia” in Cambria. Three addresses were provided. The first, 2112 Main Street, does not exist; it’s a large, undeveloped lot. At the nearby Redwood Cafe on the opposite side of the street, an employee “thought” he remembered a Pedro Garcia who “moved away a long time ago, a long ways away.” The second address is a single family residence that has been occupied by the same couple for 23 years; they have never heard of a person named Pedro Garcia. And the third is a post office box for which information is not available. for the benefit of Cambria students, district staff, and the community. Not looking good! The school board refuses to comment on the Pedro Gracia issue with one board member even claiming that he exists! They’ve promised that they would address the concerns of the community but instead are in the process of writing a press release extolling the virtues of Chris Adams. Maybe it’s time we started pressuring the Cambria to pursue this issue again… donde esta Pedro? Hey, Cambrians…wait til he tries to raise the rate on the well that sits on school district property. His true personality will shine for all rate payers in town to see. Subsequently, I don’t want to hear how he lowered the bond rate on the school bonds to save us money. Him bullying town into paying the school district more money is just par for the course. Wake up Cambria, call the CCSD and tell them we don’t want to pay Mr. Adams one more dime for our well. This town does enough for this school district. It is time for the district to give back to the community. You think the free lunch and Pedro are big issues??? Ask the school board why they hired an assessor to evaluate the well lease…I don’t think it is because they want to lower our rate, he could just do that out of the goodness of his heart. Fresh meat I see, do tell. Is this a rate increase that would occur under someone else also? Or is this just pure evil disguised as a well? I have no dog in this race, other than a strong aversion to those who abuse their power to enrich themselves, at the expense of taxpayers. The post, above, is in answer to stuuuuuned’s question.